Kaidan Alenko is a human character that goes through a change in his sexuality from the first to the third game. 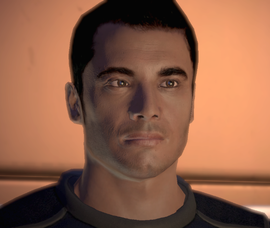 In the first game Kaidan is a heterosexual character who demonstrates his interest on a Female Shepard from the start. However, in the third game, Kaidan is bisexual character that can engage in a relationship with Male and Female Shepard. Such changes on a character canon caused some fans to argue Bioware decisions to expand the possibilities of romance in ME3. This entry was posted in 2010s, Bisexual, Bisexual (explicit), Queer Men on October 30, 2015 by Adrienne Shaw.